In nine days my son will turn two and like all other parents I’m left scratching my head and wondering where that time went. I brought home a little squeaky thing in the summer of 2010 and I’ve watched him grow into a great kid. He loves his friends and family. He’s affectionate and silly. He enjoys conversation, food and playing – all with contagious gusto. 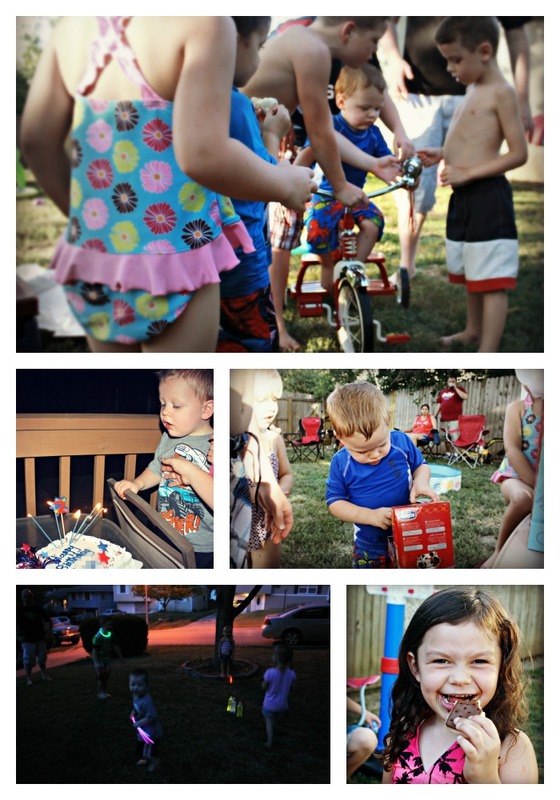 To celebrate the two years we’ve spent loving him, we decided to throw a combination Fourth of July/Birthday party, timed perfectly with the visit of his MawMaw and cousins. In an effort to keep things on a smaller scale, my husband and I each only invited one friend. Of course, when you add in spouses and children, we still ended up with a house (and yard) full of love and laughter. My husband manned the grill while the big nephews and I worked on a little science experiment from Pinterest. Supposedly, pouring in juice in a certain order causes the colors to stay separate from each other. We followed the directions on the Pin and ended up with purple juice. Tasty purple juice, but not the effect we were going for. It was The Gamer’s idea to change the order of the juices and TADA! It worked! Even the adults wanted the pretty drink, so I got quite skilled in my presentation by the end of the party. 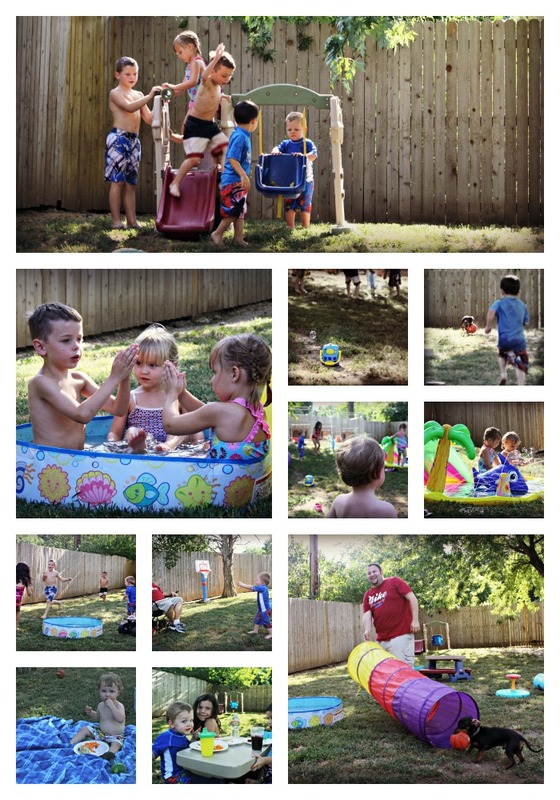 Outside, it was complete soggy insanity as nine kids ranging in age from one to 11 ran through sprinklers and wading pools. Our poor bubble machine tried in vain to keep up, but the best it could do was sputter a sad little sphere here and there. As the sun began to set, Monkey’s friends “helped” him open his gifts while sitting at the cute little picnic table his MawMaw sent him. 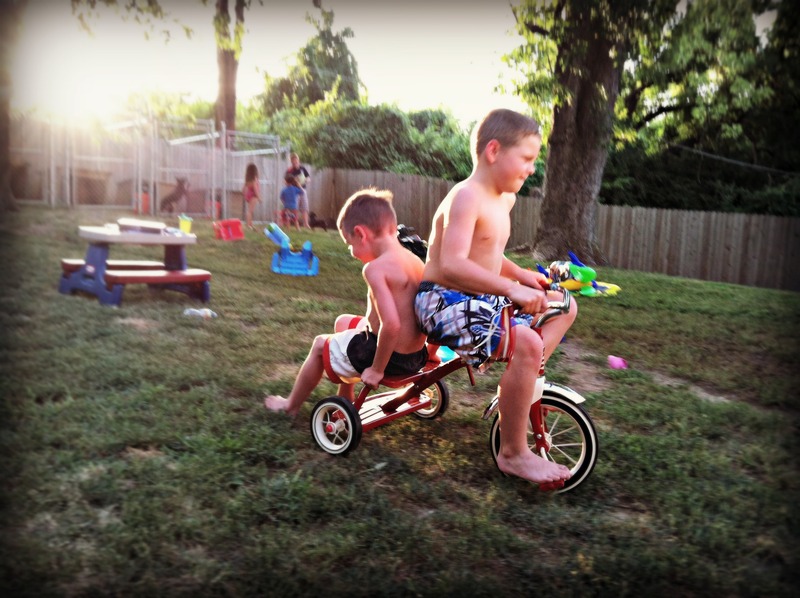 When his Daddy wheeled out his gift from us, a shiny new Radio Flyer tricycle, the gasp from the short crowd was audible. They helped him onto it and patiently waited for their turns. And oh, the silliness. Later we did the usual ice cream and cake, then brought out the glow sticks for a mini-rave in the front yard. We tried glow bowling, which is harder than it looks in the dark, and then tromped up the hill to see the fireworks from the amusement park next door. Monkey loved the fireworks, shouting “BOOM BOOM” with glee each time a new explosion lighted the sky. He’d scream, “Get it! Get it!” and reach out to try to grab the colorful bursts. When the evening was finally over, we said goodbye to our friends and trudged home. While my husband snuggled with Monkey and waited for him to fall asleep, I chatted with my mom and nephews and helped them prepare for their journey back to Texas. As the clock ticked its last few minutes before midnight, the house was blessedly silent, save for the occasional blast outside from those last few fireworks people just had to set off. We slept, exhausted and content. 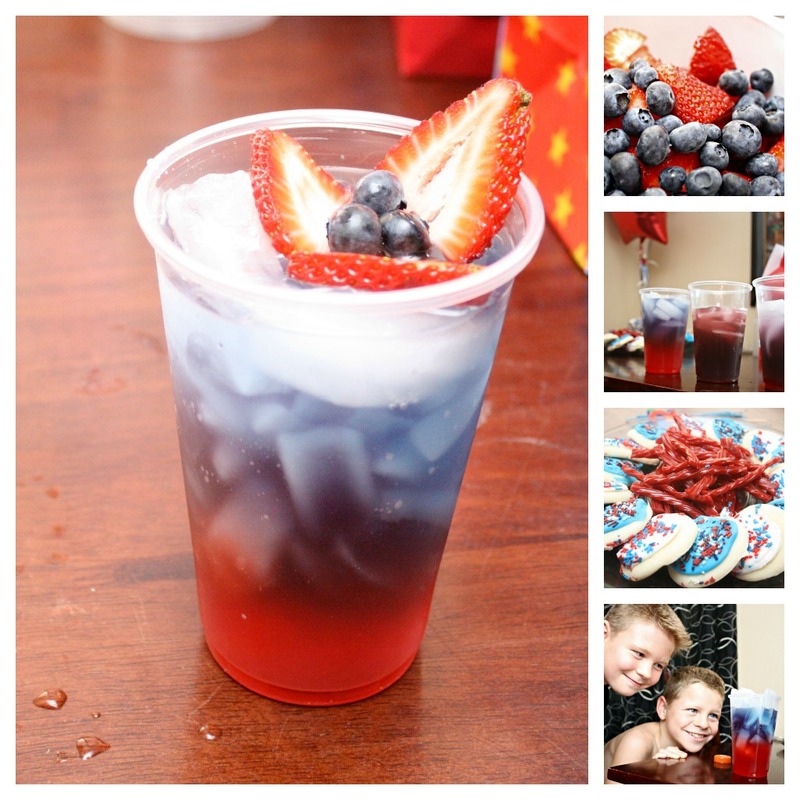 More Red White & Two photos here! The look on Monkey’s face when Daddy wheeled out the trike was PRICELESS. One of the best parts of the night. I hope he had a super fun time and is recovering today (ie napping a lot). I LOVE being “Aunt Greta” to Monkey and seeing him grow up. He’s such a handsome little man. And the kids love him, too. Essie just asked me if we were going to “Juwie’s” house today. Thanks again for letting us come and be a part of his big day! There isn’t a single photograph of that moment. We all had bad angles. But I’m glad you got to see it! He slept til 9, and is eating everything in his path again. I am looking forward to naptime! Tell Essie she can come anytime! We’ll have to do a girls’ night sleepover since Henry got a turn. Looks like a super-fun party! Monkey is so cute – happy early birthday to him! Katie, it was controlled chaos. Much better than last year though. Still, it’s going to take me most of today to recover! Love the pictures! Looks like it was a great birthday party!!! AND DELICIOUS drinks! Sounds & looks like a perfect day! Haha, there’s no such thing as a perfect day with toddlers running around! But it was pretty awesome, that’s for sure! What fun, Mamamash! I, too, just celebrated my son’s birthday – his 40th. You’ll be there someday, ha, ha, ha. Beautiful pics of a happy day. Thanks for sharing with your readers. I don’t even want to think about that yet, Kathleen! But I guess it went by pretty fast, huh? So much fun and love. YAY!! Sounds and look like it was a fabulous event! I can imagine how well everyone slept. This heat just zaps the life out of ya!! Loved the photos. It does go so quickly. Lil Duck will be 4 next month. Looks like so much fun! Those drinks look yummy! That’s a great way to spend the day celebrating Monkey. I’ll take one of those drinks but the adult version. Thanks.